The Listen and repeat Multimedia Interactive Learning Application (MILA) is a context based approach to pronunciation and phonemic awareness. 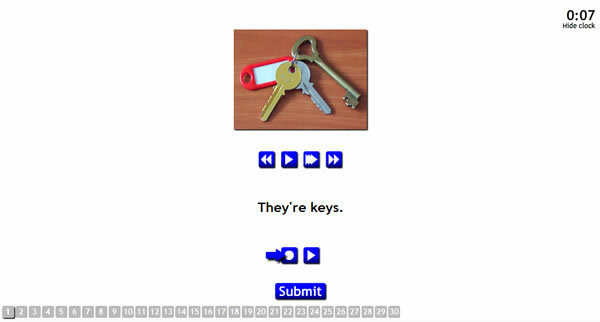 It generates an activity where learners look at the accompanying image, listen to the example sound, word, phrase or sentence and then repeat it into their microphones. They also have the option of listening to the audio slowed down but without altering the pitch (also known as time stretch). This gives the effect of someone talking slowly, making it possible for learners to hear natural pronunciation in greater detail. The application records their voices and plays it back to them for comparison with the example.